ZEOS FOR MEN’S QU3 SKINCARE! Finding confidence with the award winning skincare range from ZEOS® for Men. For those of you who’ve never heard of ZEOS®, let me fill you in on a little bit of their history. Back in 2014, the company started a revolution in hassle-free male grooming – helping to reveal the man inside. Their warm waxing kit has helped men – and those who appreciate them – across the UK to enjoy taut, fuzz-free skin for weeks, achieved in the comfort of their own home with a professional salon finish at a fraction of the cost. They have since continued to push their ethos of giving men the right products, designed for them and containing the stuff they need to feel better, look better and play better by revealing a skincare range (which I’m lucky enough to review) and most recently by revealing a premium blend of beard oils too. 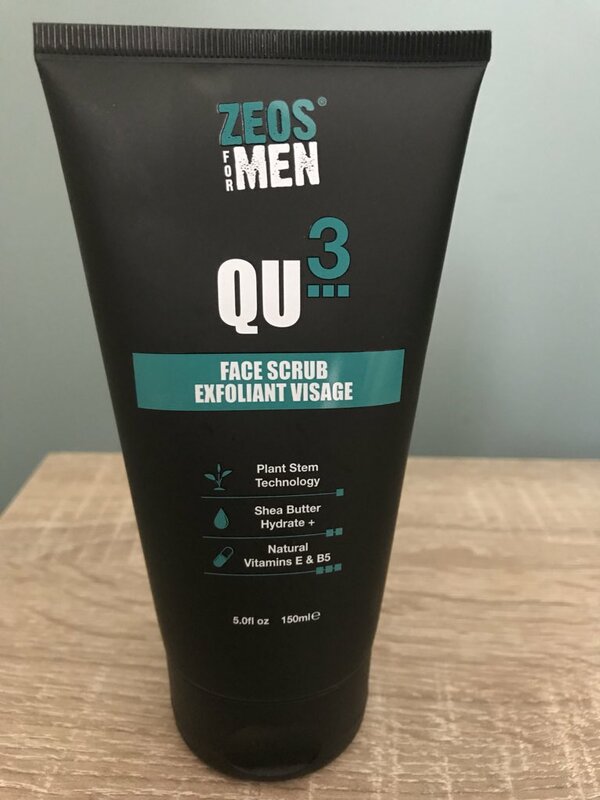 ZEOS® for Men QU3 Face Scrub Exfoliant Visage: 10/10! Exfoliating your face is an important part of your grooming routine, removing dead skin and unclogging pores to prevent blackheads. The issue is though that scrubs can be quite abrasive and when you have sensitive skin, like myself, it can take its toll. However, ZEOS seem to have mastered that. With natural coconut husk scrubbing away dirt and oil, the Shea butter helps to moisturise the skin. I’ve been using the scrub twice a week, gently rubbing it in circular movements around my face and I can definitely feel the difference. Note: It does seem runnier than other scrubs that I’ve used but that just makes it a whole lot easier to rub off! 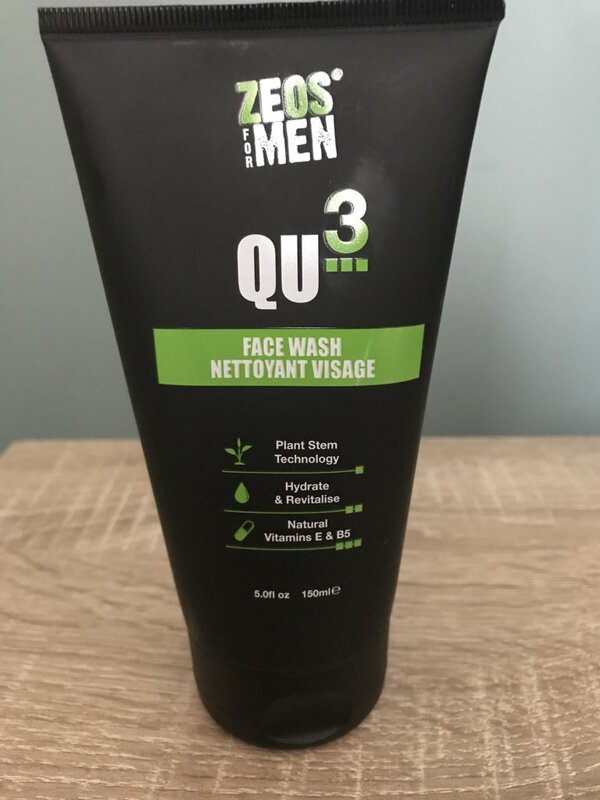 ZEOS® for Men QU3 Face Wash: 10/10! The clear in colour gel just glides over the skin, lathering up nicely. The face wash is used to hydrate, nourish and protect your skin with the help of natural Vitamins E & B5. I find the product best to be used first thing on a morning because it’s so refreshing and wakes me up. However, I also have used it on a night and it can be a nice treat after a hard day at work! Note: You don’t need that much applied to your face which is also a bonus! 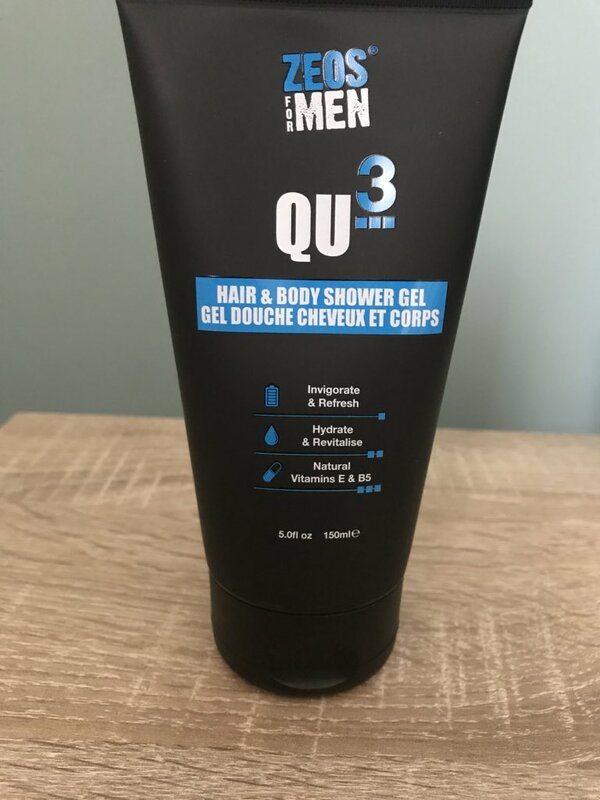 ZEOS® for Men QU3 Hair and Body Shower Gel: 10/10! Bursting with natural vitamins, this refreshing shower gel helps you feel squeaky clean and fully energised. The fragrance, which continues across the full range, is light and fresh. The unique formula helps to enhance skin regeneration. I really like using this product in the evening as it leaves me feeling fresh and there’s no better feeling than that just before bed! Note: Just like the face wash you don’t need that much because it lathers up amazingly! 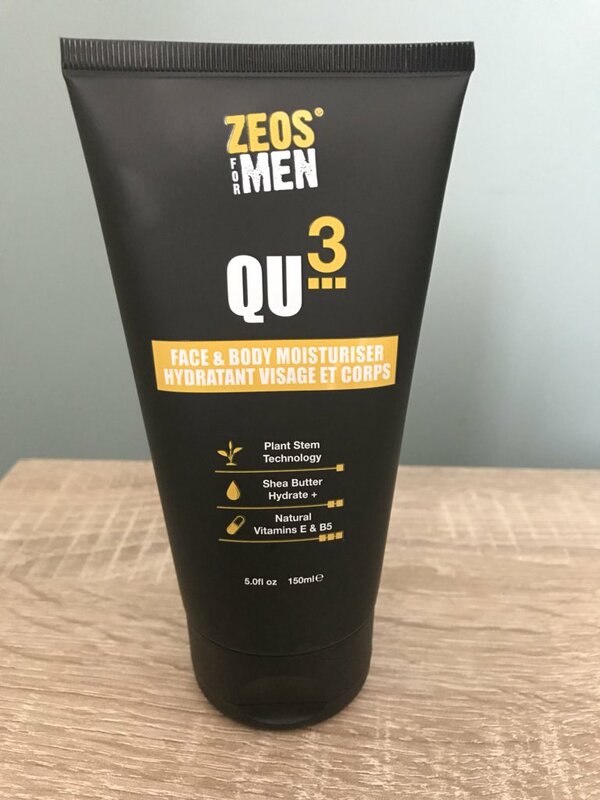 ZEOS® for Men QU3 Face & Body Moisturiser: 9/10! Powered by natural Vitamins E and B5, the moisturiser fights against dry skin by keeping it hydrated and smooth for a youthful appearance that’s full of energy. The added Shea butter+ provides optimum hydration too. I really felt the benefit on my dry skin! Note: I knocked off a point purely because I didn’t feel the need to use this as a face moisturiser courtesy of the scrub & wash! These products really are the Fantastic Four. It is no wonder that the skin care range has won awards. The fact that it is so competitively priced is an amazing thing too. It is worth every penny. I’ll certainly be swapping some of my products for these and buying them as gifts for friends too! It is also refreshing to see that these products aren’t tested on animals and suitable for vegans. I also love the fact that they have now converted to 50% sugarcane packaging as a raw material (Maximum legal amount allowed) in order to help fight the amount of plastic waste in our oceans.